Four in the morning came way too early today,only to find it raining like all get out. So instead of fishing,I went back to bed and waited . By 5:30 it was misting but figured might as well go. Made some coffee, out the door.Fishing was horrible.I threw everything at them. No takers. Then it starts raining again, really coming down hard, and I'm soaked.This just won't do so I head off to a nearby bridge to wait it out in my yak. Bored waiting for the rain to stop, I figured I would throw out into open water to kill time. It's raining so hard, you could not even hear the "gulp gulp" of my popper, when all of a sudden kaboom! A bass slammed that plug in open water in about 10 ft of water. She jumped out of the water once and shook her head. Nothing like a show in the rain! 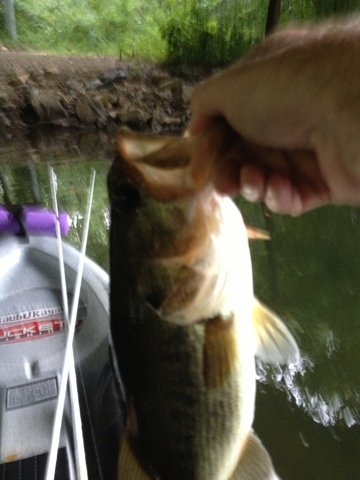 So the lesson here is, well at least for me that bassin' when there's a hard rain might not be such a bad idea! Next time it starts raining, you might want to grab your stuff and head out. 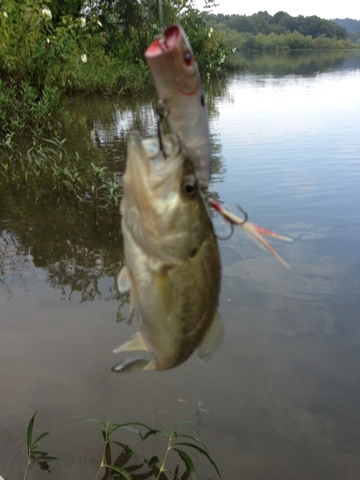 By the time I got that bass off my popper, the sun was back and actually caught 2 more small bass in that deeper water. How Much Does That Lure Cost?